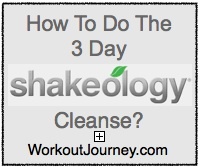 Most people who have bought Shakeology have heard about the 3 Day Shakeology cleanse. If you have not heard about it by now then you should really look into doing it as its a quick way to put your body through a detox if you will. I’m not a nutritionist but merely a messenger of how to do the Shakeology cleanse. From what I’ve been reading, it is not a true cleanse because you are not deprived of calories and nutrients. What this does is provide maximum nutrients with the least amount of calories. You need to follow the same regimen for 3 days straight. Have 3 Shakeology shakes per day, 1 or 2 pieces for fruit as a snack, and 1 salad for dinner that can include chicken or fish. Drink 2 to 4 liters of water every day and go easy on the salad dressing. Limit your use of salt and pepper with the meals too. Dinner: Salad with fish or chicken served with 3 servings of vegetables. Use 8 to 10 oz of water blended with ice in each Shakeology you have. All in all you should be consuming 800 – 1100 calories per day while doing the 3 Day Shakeology Cleanse. Try to do one every 4 months or in between workout programs. Try not to do a Shakeology cleanse during a normal week of P90X or Insanity because you will not have as much energy to complete the workouts. Beachbody’s in house fitness guru Steve Edwards says that a recovery week would be an ideal time. Lay off other supplements during the 3 days. Do a 1 or 2 day Shakeology cleanse if you ate or drank a lot over the weekend. This is a quick way to get all of the gunk out of your system and back on track. I have done the 3 day Shakeology cleanse 3 times. I only lost 1 pound and just barely a .5% of body fat each time. This was to be expected as I already ate well and don’t have a lot of weight to lose. Even though I take Shakeology daily, this for me was more of a way to get whatever junk I had in my system out before starting my next 60 or 90 day workout program. When I woke up on the 4th day I felt lighter and mentally better. All of the ingredients that come in Shakeology had a chance to get to work without any interference from the other things I ate. The only down side I felt from doing the Shakeology cleanse was that I was starting to feel very hungry on the third day. I knew this was coming as I cut my normal calorie intake in half. The Shakeology cleanse is a great way to jump start your weight loss or a way to clean out your body before starting a new workout program. Its really not a hard program to follow and you’ll be surprised how your body reacts to it in such a short period of time. Each person will have different results but it is nice to give your body a chance to cycle out the bad and replace it with high nutrient meals over a 3 day period. At the same time this assumes you already have Shakeology in the house. I’ve had a bag sent my house every month for 7 years and will continue to do so. If you don’t buy Shakeology already then you might enjoy the 3 Day Refresh.